MOSCOW, Russia -- Russia on Wednesday issued a new banknote dedicated to Crimea, the Ukrainian peninsula it annexed last year, in a move likely to anger Kiev which says it wants the territory back. The two sides of a new 100-rouble ($1.41) banknote, depicting a memorial to sunken ships in the port of Sevastopol and the Swallow's Nest, a cliff top castle near Yalta, are seen in this handout image provided by the Russian central bank December 23, 2015. Russia seized Crimea from Ukraine in March last year in a military operation denounced by the West which imposed retaliatory sanctions on Moscow that remain in place. 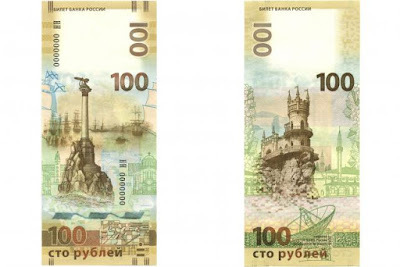 The new banknote, worth 100 rubles ($1.41), depicts a memorial to sunken ships in the port of Sevastopol, where Russia keeps its Black Sea Fleet, and the Swallow's Nest, a cliff top castle near Yalta. The yellow-colored note also features a watermark of Empress Catherine the Great, who extended the borders of the Russian Empire in the eighteenth century to absorb Crimea. Russia's central bank said in a statement it would issue 20 million of the new notes. It has previously minted a 10 rouble coin to celebrate Russia's control of Crimea.